This is a comfort food salad. 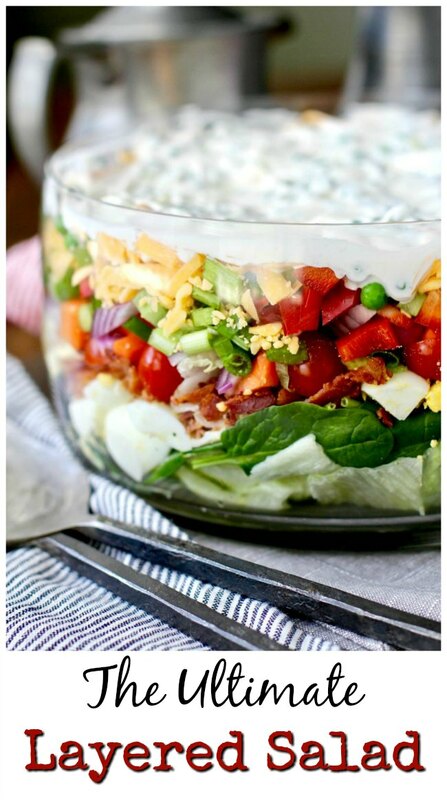 It's hearty and filling with the old fashioned iceberg lettuce, a pound of bacon, hard boiled eggs, cheddar cheese, peas, topped with a mayonnaise and sour cream dressing. Sometimes you just need a little throw back salad. It's perfect for a picnic, family reunion..... or a bunco party!!! This salad is super easy to make. One of the nice things about making a layered salad is that you can (and should) make it in advance, and refrigerate it for up to 8 hours. On a bed of iceberg lettuce and baby spinach, you layer the eggs, bacon, tomatoes, carrots, onions, bell pepper, celery, cheddar cheese, and peas. They you spread the dressing over the top, sealing the edges, and let it rest in the refrigerator. You toss the salad just before serving. 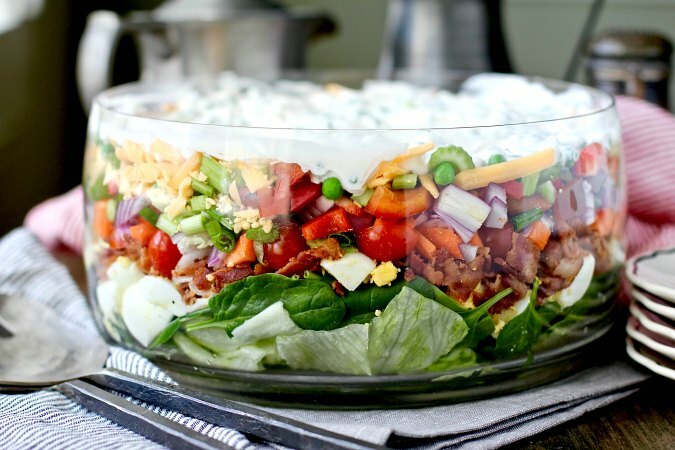 You can vary the veggies in the salad, but be sure to keep the iceberg, spinach, eggs, bacon, cheddar, and peas. They definitely make the salad. Use a clear glass bowl or trifle dish so that you can see the pretty layers. Be sure to arrange the bulk of the layers around the edges and fill in the middle with more lettuce as needed, especially if your bowl is wider. I've updated this post from five years ago with new photos and a printable recipe. I'm still not very precise with my layers, but I still think it's bright and colorful. I hope you give this a try! 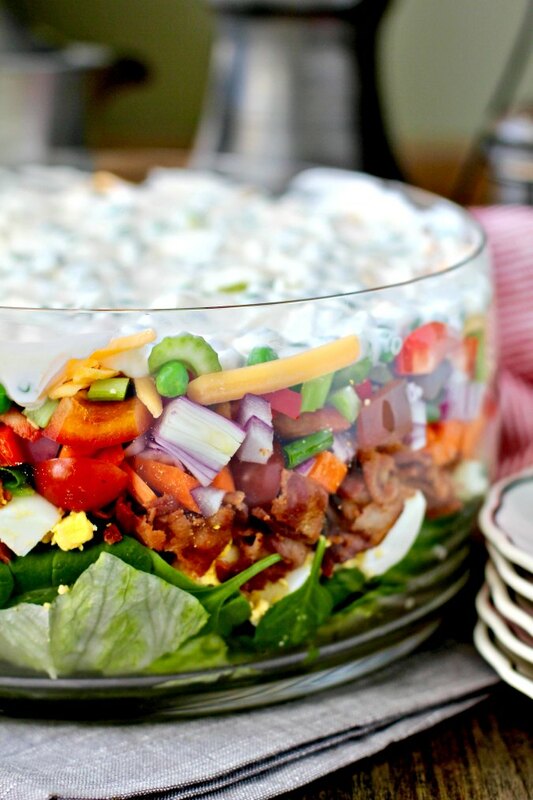 Layer the salad ingredients, beginning with the iceberg lettuce, and then the spinach, hard boiled eggs, bacon, tomatoes, carrots, red and green onions, bell pepper, celery, cheddar, and top with the peas, adding salt and pepper to taste every few layers. For the layers to stand out, concentrate the layer ingredients around the sides of the bowl, sprinkling the rest over the middle, and adding lettuce to fill it in. Combine the mayonnaise, sour cream, and sugar and spread it over the top of the peas from edge to edge of the bowl. Cover and refrigerate for at least two hours or overnight. Toss the salad right before serving.